Have you ever collected anything? Books, stamps, stickers, coins, matchboxes, car toys, dolls, video games, or anything else? If you did, you had fun! Growing and browsing your collection is a great feeling that non-collectors can’t understand. What if you could also collect fascinating information? What if you could collect memories and experiences? What if you could collect goals, habits, projects? What if you could collect things that are actually important, and it did not matter if they exist physically or just in your mind? All that in visual, fun way…? Is that something you would be interested in? Mind Collected allows you to collect anything. Now you can have unlimited visual collections of ANYTHING in a single Windows software! Creating your collection in Mind Collected couldn’t be simpler. Simply click the “Add Item” button, write the item’s name, and either auto-find its picture on the Internet or provide it yourself. You can also attach documents, links, and write detailed notes for each item. Tag the items in your collection to instantly create visual galleries of the collected items, based on the tags. You can click any of your tags to instantly view visual gallery of all items with that tag. Each item can have multiple tags, too! All your collections are in a single database. This allows you to connect and hyperlink items in all your collections to each other, and even put the exact same item into multiple collections – simply by tagging it with more tags. You can also add overlay icons to items in your collection! 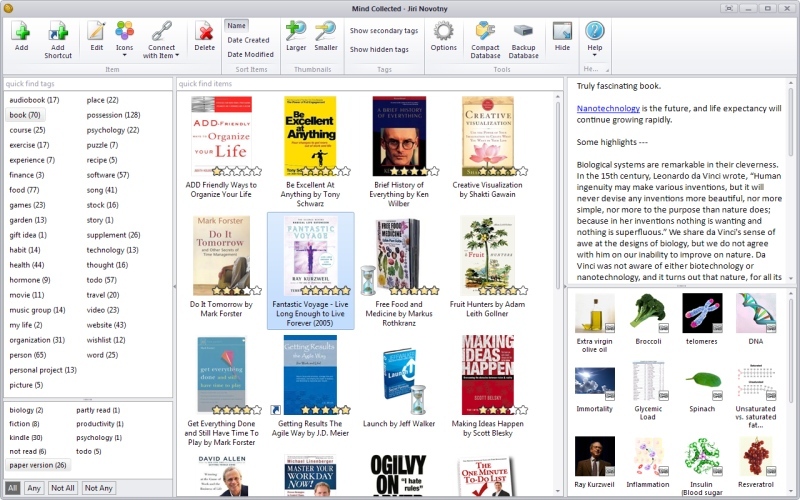 Download free 30-day trial of Mind Collected for Windows and start collecting – it has never been easier and more fun. PS: Any questions? Ask me in the comments below!